Antigonon leptopus is a climbing tender vine with showy red, pink or white blooms native to Mexico and Central America, a member of the Knotweed family, Polyconaceae. The vines cling by use of tendrils and cover a wall fence or trellis quickly forming a colorful display. In cooler areas they are often grown as annuals and can soon reach 40ft long. 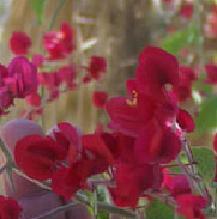 The leaves are small dark green and heart shaped and in the summer the vine sports arrow shaped blooms. The plants are easily propagated by means of softwood cuttings or by sowing seeds. Seed should be sown in a light mix of peat and sand and barely covered. Keep moist at about 65-70F until germination. Transplant outdoors only after all danger of frost has passed and temperatures do not fall below 60F. If grown for greehouse culture, keep the seedlings well watered in summer and fertilize with a water soluable balanced fertilizer every two weeks. In the late fall or early winter, cut the vines back to about 6 inches in height. If grown outdoors, the tubers can be dug in late fall and overwintered at 40F for planting the following spring. Seeds of A. leptopus is edible and is prepared like popcorn by roasting the seeds, then removing the husks. The plant has also been used as an ingredient in steam baths. The seeds are also eaten by a variety of animals. Hardy to 30F(-1.1C) Height: 40ft. (vine) Spread: 6ft. Coral Vine - Antigonon leptopus - Bight clusters of coral-pink blooms. Vine to 40ft.